UNITED NATIONS, July 27 -- The UN on Friday announced that it has chosen, through a competitive and open process, Swedish conglomerate Skanska, which it called a highly ethical firm, as the construction manager to renovate its headquarters building, work worth over $1 billion. Skanska was fined $25 million earlier in the month for bid-rigging and operating a cartel in connection with other construction projects. Inner City Press' request for the names of the other two finalists was rebuffed. Under Secretary General for Management Alicia Barcena said she "would prefer not to mention their names, I don't think it would be appropriate." Video here, from Minute 34:03. Ms. Barcena said that the head of the UN's Ethical Office, Robert Benson, had "brought in two external people" to review Skanska "all over the world, to make sure they have no problems." This finding was made, she said, in a June 12 report. 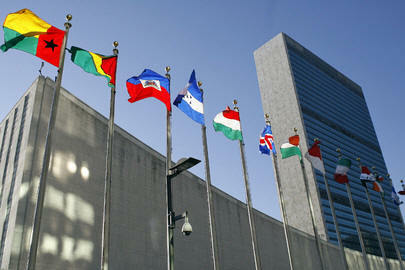 Inner City Press asked Paul Buardes, Chief of the UN Procurement Service, for the names of the two "external people." Mr. Buardes said to ask Bob Benson. An e-mail to Mr. Benson and his colleague Susan John, asking among other things for the two names and if the July 10 bid-rigging verdict against Skanska was considered, was not returned by deadline. "A group of Swedish construction companies including Skanska AB and NCC AB were found guilty Tuesday of acting as a cartel... The Stockholm district court ruled that Skanska, NCC and six other companies in conjunction with the National Road Administration fixed bidding contests for building contracts. They were ordered to pay a total of $68 million in fines. Skanska was fined 170 million kronor ($25 million)... The court said the companies fixed bidding contests for construction projects awarded by the road administration in southern and central Sweden. It also ruled that NCC, Skanska, Peab Sverige and the road administration breached antitrust laws by agreeing on the distribution of contracts to rebuild bus stations in the city of Linkoping." When will the UN finally put in place the freedom of information procedure which Ms. Barcena has said is being improved and finalized? "We are working on that," Ms. Barcena said, saying she would come and give another briefing on management issues. In the course of the billion dollar renovation, some 700 UN employees are to move to a building the UN is renting, on 46th Street near Second Avenue. Inner City Press asked Ms. Barcena how much the UN is paying, and if it is true that the UN will be doing most of the construction in the "swing space." Ms. Barcena acknowledged that the UN "has to prepare that building," with the help of the "construction management," presumably Skanska, but that she didn't have the budget figures with her, and to ask John Clarkson. The subsequent response Inner City Press got is that the UN will pay for work on the space it will occupy, but not the elevators or bathrooms. Again, no budget information was provided by deadline. At least one piece of information was promised to be given in the (near) future: the names of the two losing bidders. UN Procurement's Paul Buardes said that he couldn't give the names because "they haven't been notified yet." "They probably already know," Inner City Press pointed out. "We have to send the regret letter," Mr. Buardes said, adding that once that is done he will provide the two names. We'll see. An aside: it would have been nice, if the UN was aware of the bid-rigging fine against Skanska, to have it mentioned and addressed in some way in the opening presentation, and for the two losing bidders and the two reviewers to have been named. Freedom of information? We ain't seen nothing yet.